What great advice it was when an old boss of mine told me years ago how important it was to write lots of handwritten notes; thank-you and congratulatory notes, birthday cards, or just a note to say hello. I invested in some small personal notecards from a stationer and have taken his advice for years. 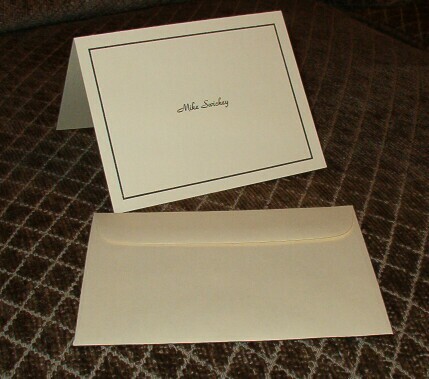 It only takes a minute and handwritten notes are appreciated, as so few are written anymore. I get great satisfaction from taking a few minutes and writing to friends and colleagues as those before us did – with pen and paper. I have posted a picture of what one of my current notecards look like. (You can always click on any of my pictures to zoom-in.) You might laugh when I tell you where they came from. Cranes? William Arthur? No, far from it…these came from discount catalog supplier Walter Drake. A set of 50 folded notecards, sized 5 3/8 x 4 1/8″ are $7.99. 100% cotton? Archival quality? Well, no, but many people have complimented me on my, “nice stationery.” Honestly, I recommend these for those who want to give it a try before committing to nice (and expensive) notecards, like those from Crane & Co. I use these Drake cards on many occasions and find them satisfying for most all my needs. It was great advice when it was given to me and I find it still can make a big impression. With the prices I just quoted above from the Drake catalog, expense really isn’t an issue. You can even get started with blank cards from the office supply store. I can guarantee you this, If you decide to take the plunge and drop a few notes, you’ll get a good feeling just from participating in an activity almost as old as the ages.